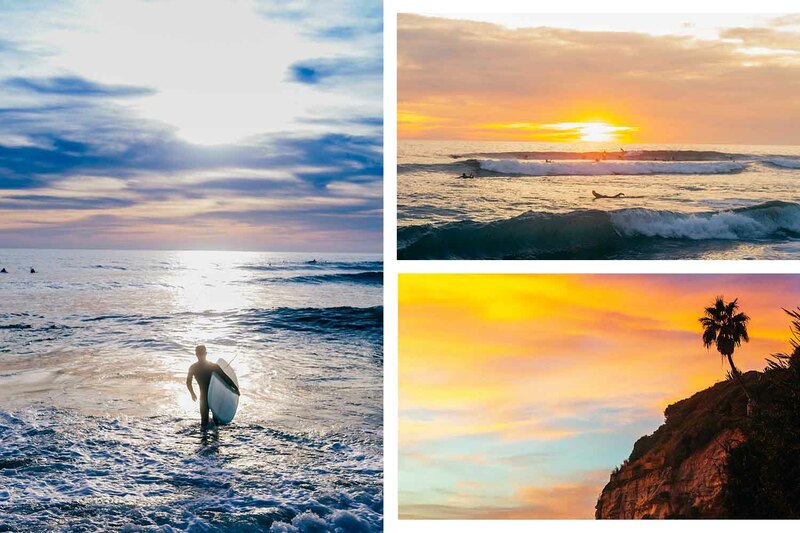 Considering a trip to San Diego? 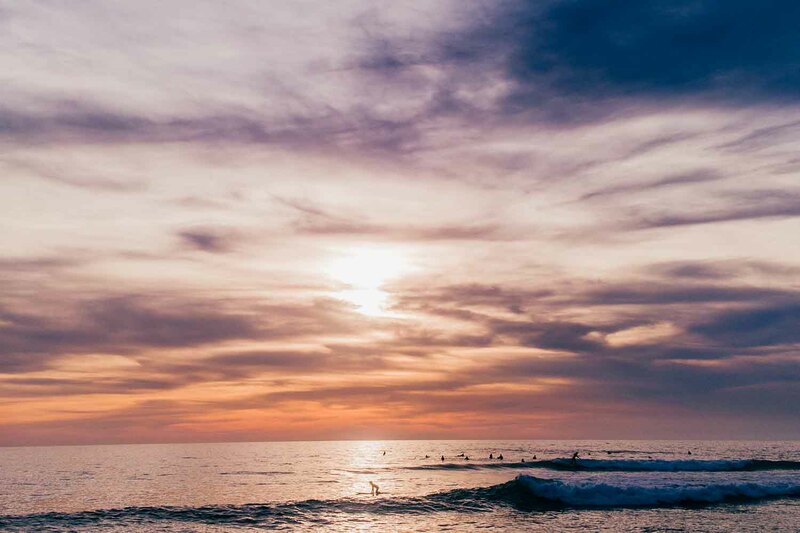 Here are some of the best things to do in Encinitas. 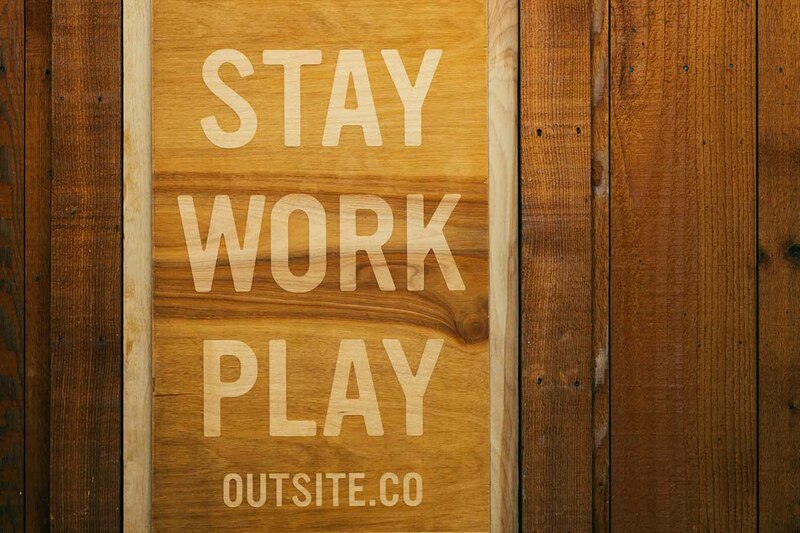 Jerry (also known as @flaco_creative on Instagram) has just toured all the Outsite spaces in California. 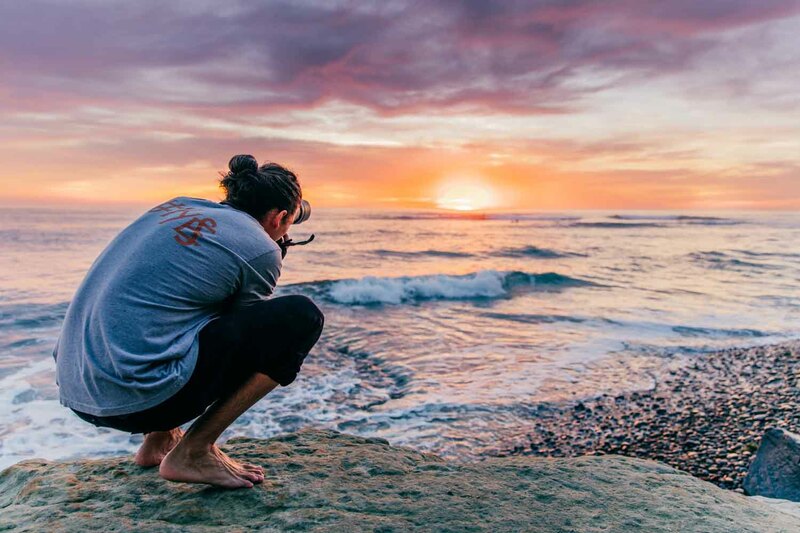 He's been scouting the best restaurants, coffeeshops and photogenic corners of the neighborhood - take a look at what he got up to in Encinitas. The first day of my California Outsite properties tour began in San Diego. 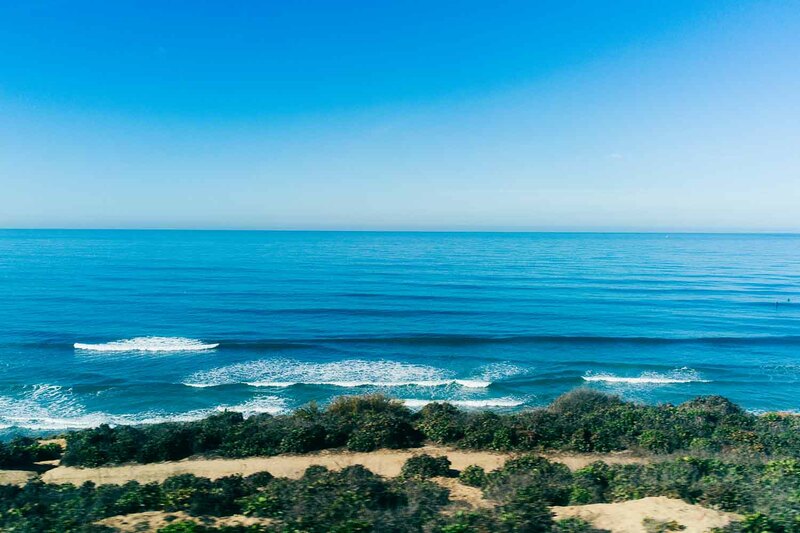 Their San Diego / Encinitas location is just a brief hour train ride outside of downtown San Diego. Upon arriving at the airport, I quickly found the help desk and inquired about using public transit to get around. You can rent a car or call an Uber, but if you are looking for a cost-effective option for getting around this is your best bet. I took the 992 bus right in front of the airport that drops you one block away from the Santa Fe Station. While at the Santa Fe Station I downloaded the Compass Cloud app, this app allows you to purchase your Coaster ticket and also see what time you depart or train arrives. Bonus, the Coaster Train has wifi and you get to see beautiful views along the ride. 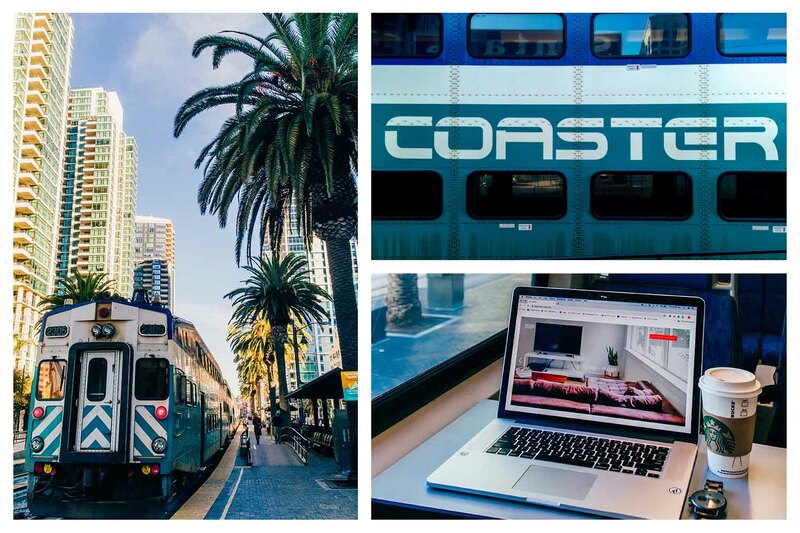 The Coaster train has a stop right in the heart of the beautiful surf town that is Encinitas, and from there a $6 Uber is all you need to get to the Outsite space. 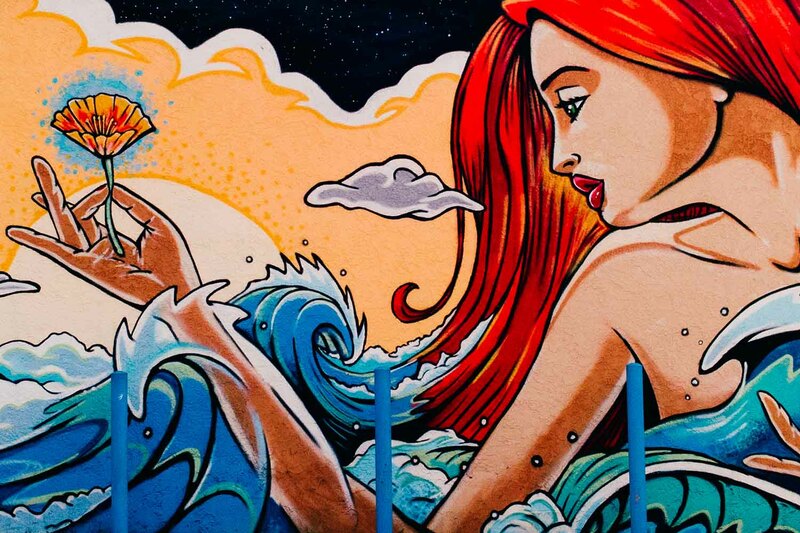 This beautiful, calm surf town is everything you think of when you picture California: cool breeze, bright sun, beautiful surf, and vast sunsets. When I arrived at the house, Lindsey the house manager (who is just good energy all around) was there to greet me. After she showed me around the property and I snapped a few photos I set out to explore the area. I spent the rest of the morning cruising up and down coast Highway 101 on the bike I picked up from Outsite (which is one of my favorite things about most the Outsite properties, it makes getting around really easy). 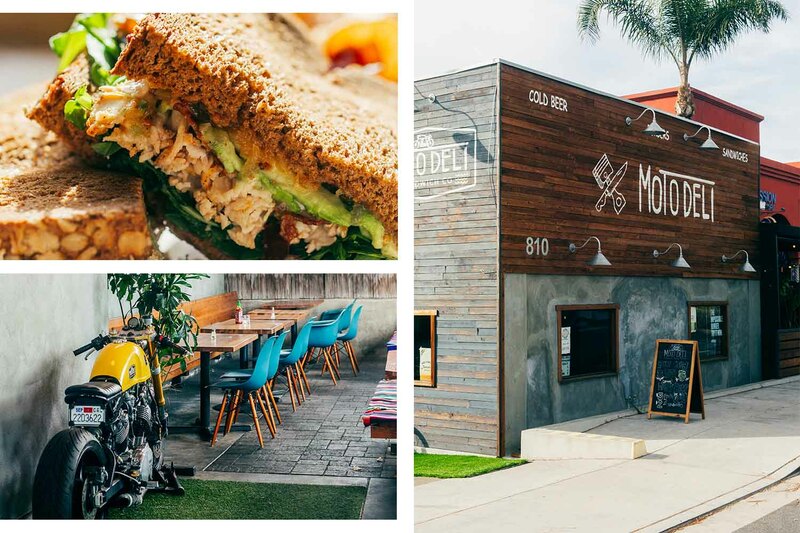 I rode the bike down to Moto Deli and enjoyed a fantastic turkey sandwich. After lunch, I headed over to Moonlight Beach and took in the scenic views and beautiful cool breeze. 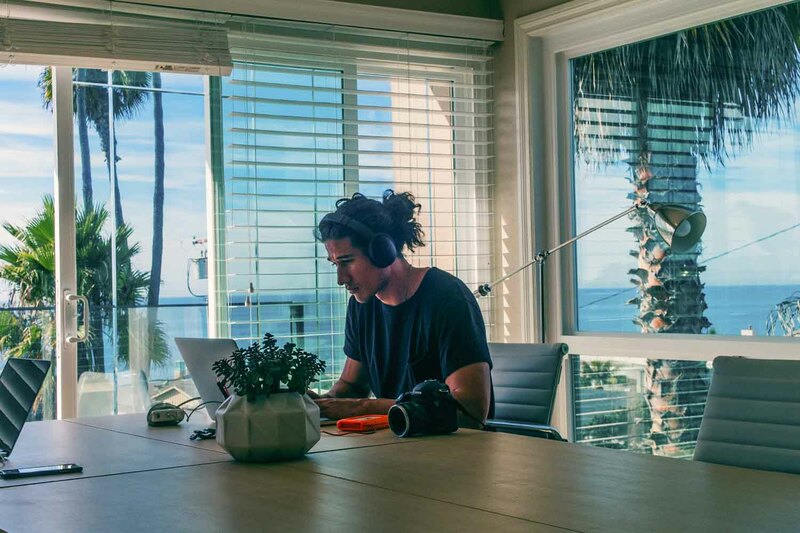 I needed to hunker down and work for a bit so soon after I went to the coffee shop right near Swamis Beach. Lofty Coffee was tasty and straightforward, but not conducive to being a good workspace due to lack of any outlets. Once my computer hit 10%, and the sun began to set I knew I needed to be ocean side to see what Encinitas sunsets had to offer. I rode down to Swamis, a spot recommended by Lindsey, and spent the evening taking photos and hanging out with my friend Greg. Words cannot explain how happy and breathtaking the sunset was. I was in awe, the cool breeze on my skin as I watched the sun dance in the reflection of the water is something I will never forget, the colors were so vibrant. As the beautiful glow faded into the horizon of the ocean, Greg and I needed to get a bit of work done, so we headed to Saint Archer Brewery. 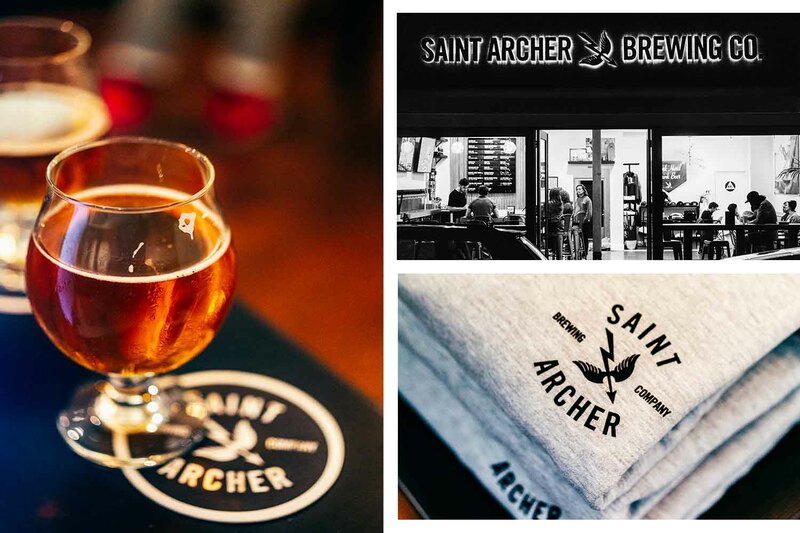 Saint Archer Brewery is everything chill and exemplifies the atmosphere of Encinitas. An easy going, relaxing, friendly place. After a Mosaic IPA and going through some photos hunger began to set in, and we knew tacos were in order! We took a drive down to a taco shop not too far from Saint Archer Brewery and just exchanged stories on travels, work, and adventure. After our late night meal, we knew it was time to call it a day, and we headed back to the Outsite location said our goodbyes, and it was time for sleep. 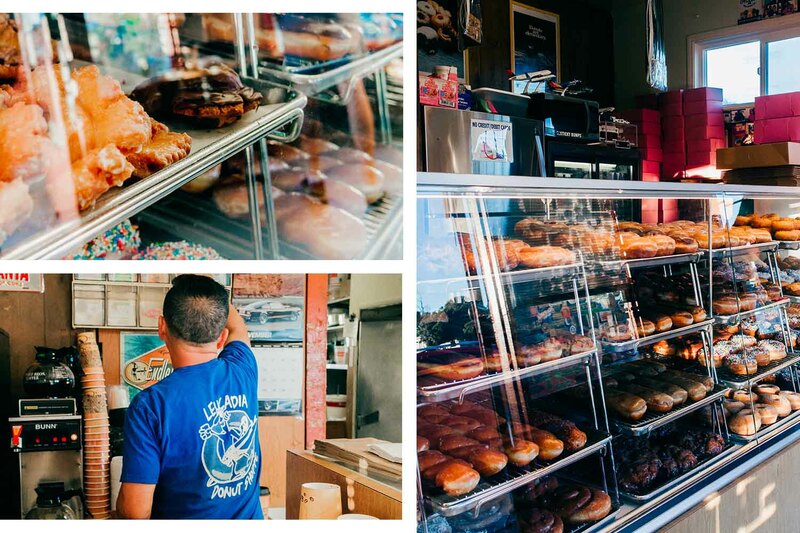 Friday morning, before getting into an intense work session, I took a walk down the street to Leucadia Donut Shoppe, enjoyed a fresh blueberry danish and much-needed coffee that kept me alive for the next few hours of work. 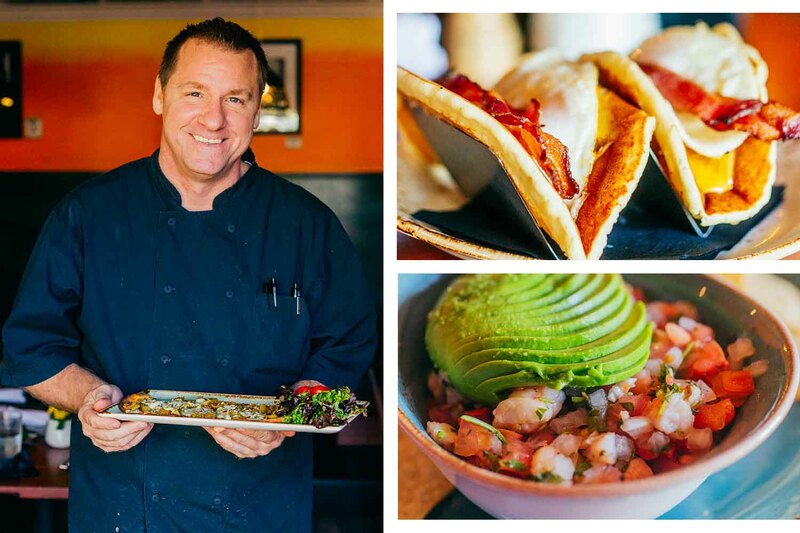 Around 2:00 pm my stomach had begun to make a strong case in favor of lunch, so I took the bike and rode over to Le Papagayo for some wonderful Mexican, Californian cuisine. I started my meal off with two pancake breakfast tacos. It was the most delicious idea, two warm pancakes wrapped around fried egg bacon and melted cheese. What more could I ask for? Well, I followed up the tacos with fig and blue cheese flatbread, the sweetness of the fig paired so well with the savory flavor of the blue cheese. I was still hungry after the flatbread and knew I needed something a bit lighter, so I ordered a fresh ceviche stuffed with avocado and a delicious Pico de Gallo. Check out their epic menus. I couldn’t breathe after all that food. The bike ride back home was slow, I when I arrived at the property Lindsey had arranged for a small happy hour with the other guest. It was nice to exchange stories on our adventures, business and life views. I needed to get some work done, before heading into the night so I plugged away for a few hours and enjoyed the sunset views from the upstairs workstation. At around 9pm the group decided we should go out and enjoy a few drinks so we Ubered down to Union, which is a 7 min Uber ride away. We enjoyed fantastic live music and a handful of beers. It was a great time, the ambiance was relaxed with a touch of elegance - I wish I would have been hungry, Pablo ordered a burger, and it looked terrific, I just had no more room in my belly for food. After a ton of laughs, we headed back to the Outsite location to rest up for Saturday’s adventures. 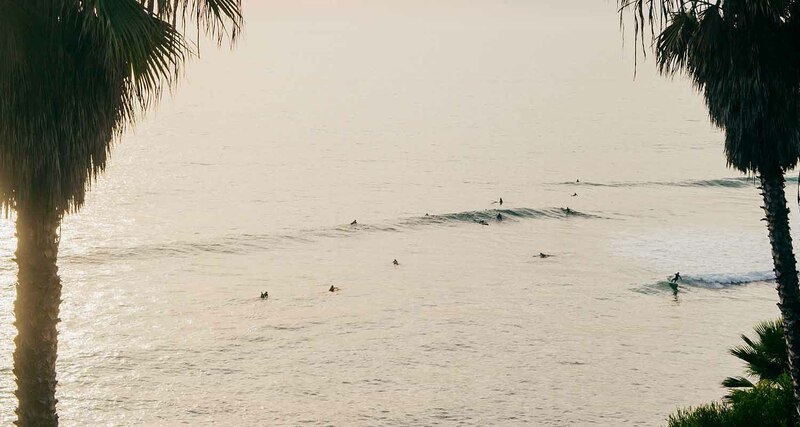 Saturday morning came, and I was feeling a bit tired from the night before, so I took a quick ride down to the beach and just watched a few surfers do their thing in the early morning and watched the sun come up. After a quiet few moments of taking in the morning, I headed back down to the donut shop down the street and just got a coffee - it was much, much needed. By 10:00 am Lindsey and a few others from the house headed down to the beach for a quick surf! I didn’t surf just spent the time in the freezing water taking photos of those who did! The water felt amazing even though it was cold, I should have packed a wetsuit - instead, I made do with board shorts and thick skin. Everything about that early morning was beautiful and after we headed back to Outsite - to clean up and get ready for my next adventure! After a quick shower, I took the bike down to Panikans - a super quaint coffee shop and ordered a substantial triple shot Espresso Mocha Cafe that I desperately needed since I was still feeling sluggish from the evening before. I enjoyed my coffee and worked for the next few hours before heading over to Solterra Winery, where I was tended to like family. Max, Chris, and William made my dining experience extremely intimate and gave me a tour of the property too. 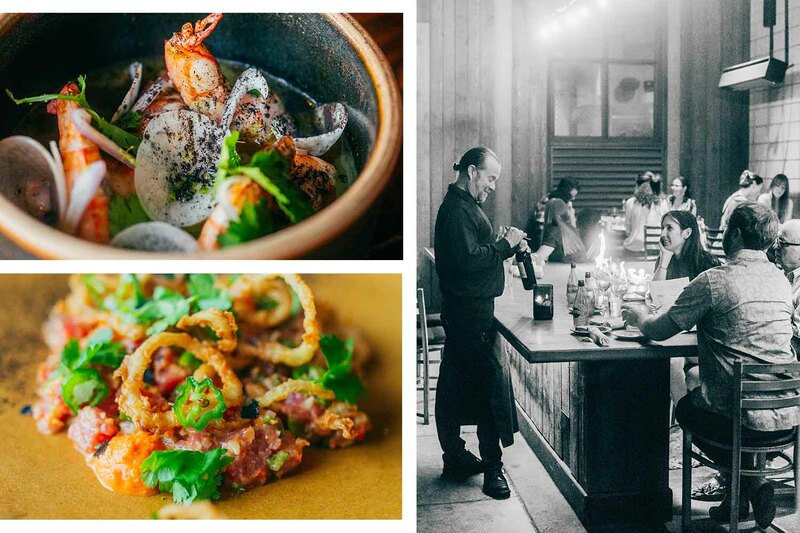 Solterra Winery & Kitchen was something extraordinary, their menu was full of flavor and crafted with genuine intent! Chef Willie was insightful when describing each plate, and honestly, I can go on and on about the quality, presentation, and flavor. But at the end of the day, this beautiful location with an in-house winery is a 100% must while in Encinitas. 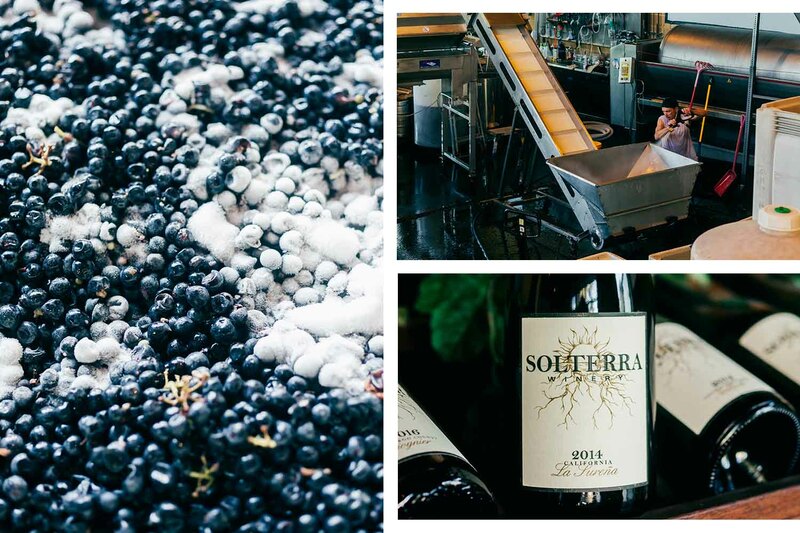 Check out the options at Solterra on their website. After a beautiful dinner, I rode back to the house to take in the last of my evening and set myself up for the Sunday commute to Venice Beach. 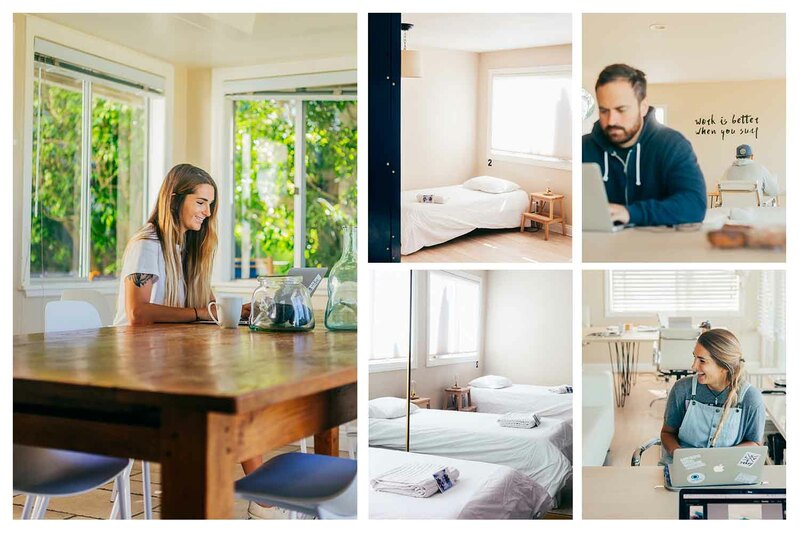 My time in Outsite San Diego / Encinitas location was terrific. The other house guests were always kind and approachable, Lindsey was super helpful, and the property and city were fantastic.